for this australian home, the word “green” has multiple applications. you might be referring to the collection of cacti, palms and succulents that grow throughout the house. or you could be talking about that amazing shade of green that is used in the most perfect places. 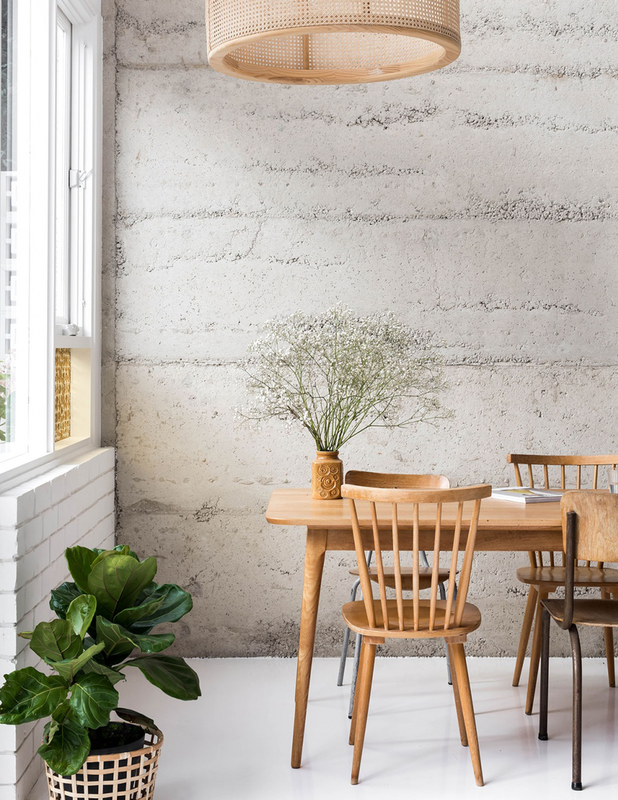 the word “green” also defines the eco-friendly mission upon which this living space was created: a sustainable and impossibly chic method to urban living. i really love using the color green in kitchens (as last seen here). it feels clean, homey, unexpected. although the color made me fall for this kitchen upon first glance, it is the seamless use of squares throughout the home that i really love. 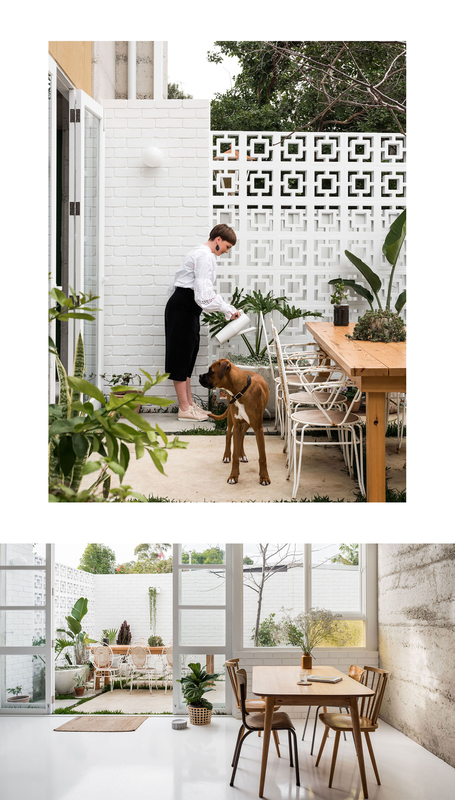 you can find squares in the kitchen and bathroom tile, that amazing grid partition, and the retro square wall that frames the patio. there is a sense of simplicity and minimalism yet there are so many patterns hidden if you take a second look. one thing you might notice is the amount of concrete used in the living space. it was an intentional eco-friendly decision which might have translated as stark and cold — not the best material for a cozy retreat. somehow this house feels the exact opposite. it feels relaxing, light, natural. the homeowners used a mixture of recycled materials and found or vintage accents (plus plenty of plants) to add warmth. so smart. i love love love the unexpected green tub. in all honesty, i’ve always wanted a colorful tub for my bathroom and now i think mine will have to be a similar emerald hue. it’s a surprise accent and it pairs nicely with the grid motif, uneven concrete, and stark white faucets. this beautiful patio is amazing outdoor space for urban living. i especially love the square retro accent wall and the way the homeowner decided to mix reclaimed wood with rusting metals. never have i ever connected with a collection of home wares as deeply as i have with cb2's fall arrivals. take a minute to appreciate it all: the cane furniture, pops of dandelion yellow, vintage vibes, and that shell armchair -- all of it is coming home with me. (or so i wish). but as i drift back to planet earth, i still feel the need to transform my personal aesthetic to match this perfectly curated collection of vintage meets modern. one that is effortless and worldly, but still comfortable and inviting; like you're always just coming back from a trip abroad with that perfect found piece for your home in tow. yeah, i could live with that. in all seriousness, this fall collection is really good and was worth sharing. i managed to narrow allll of cb2's new arrivals down to 12 favorites, but if i had to choose i think my #1 has to be the cane desk -- it feels so glamorous. 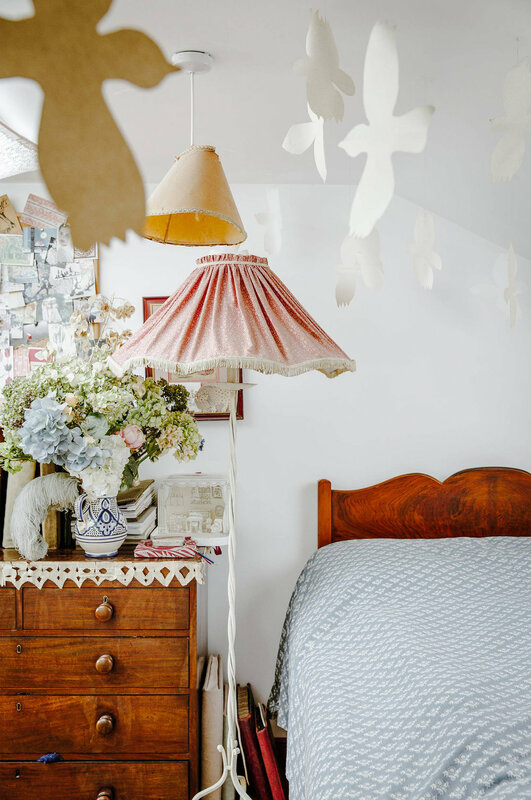 a little home inspiration for your friday morning, and it's realllly cute. this charming old-meets-new kitchen is everything you'd ever want in a home. there is a subtle nod to the house's original 1939 Tudor aesthetic, but with modern delights -- like that tiled floor! there's a lot going on, but everything works together seamlessly. 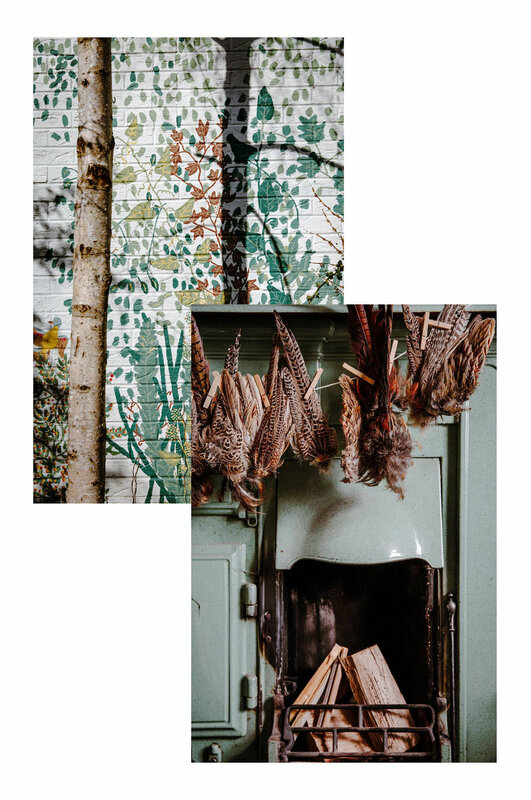 from the brass elements to the special details (like an oil painting, and gingham tea towels), this kitchen was curated to perfection. per-fect-tion. the emerald green cabinets made me really fall in love with this kitchen. i would have never thought to use dark green for a kitchen cabinet, but i like it so much more than the traditional white or wood. it's a refreshing change. a close up of this gorgeous floor. and that gorgeous stove. every kitchen needs a space to display a collection of curated objects, cookbooks, and pretty bowls. i love the idea of adding an oil painting to the mix. the floating wood shelves add a much needed natural texture in this pattern-happy room, and a place for your eye to rest. i love that the shelves add a warm farmhouse feel, especially when paired with that perfect porcelain sink. another little nook for dishes and collectables next to a handsome smeg refrigerator -- one appliance that will permanently live in my fictitious dream home (i've been coveting smeg's toaster too). this apartment is stunning -- full of unapologetically bright colors and exciting pattern combinations. i know i say this a lot, but can i please live here? this red and white kitchen is my favorite room out of the whole home tour, and it might be easy to see why -- it's really all about the floral walls & zig-zag ceiling. both are actually hand-painted, and the high ceilings help make an otherwise intimidating combination work impeccably. i love that the owner took a risk with this; the mural makes the space feel complete. this home is a one-room flat located in a hotel in Jaipur, India. six years ago, Dutch fashion designer, Marie-Anne Oudejans (most known for her work with Tocca), moved to this royal city in hopes of finding adventure. based on how cool this apartment is, it seems like she found what she was looking for. every corner is dripping with opulent details -- like this golden mirror frame, and funky canopy bench -- but it has enough places for your eye to rest, like the simple floors and calming blue paint. fun fact about Jaipur: it is known as the Pink City of India due to its salmon-colored buildings. Jaipur is also the country's epicenter for shopping where you can find treasures like gems, textiles, carpets, antiques and jewelry. upholstered headboards are quite common, yet you never see them mixed with a metal canopy bed. noted. the zig-zags continue in this precious dressing room. i absolutely adore every detail, down to the sleepy dog. when it comes to houses, apartments, lofts, vacation homes, you name it, i will always (always) choose a fixer upper over a new build. ironically, i grew up living in new construction -- new house, new neighborhood, new everything. it wasn't until college, when i moved into a long list of Boston apartments, that i started my romance with old places. living among the chipped paint and not-so-modern kitchens, i was introduced to the narrative inside their front doors: the worn hardwood floors and brick fireplaces, crown moldings, hissing radiators and original built-ins. old stuff. i just can't get enough. i found this colorful apartment on Apartment Therapy, isn't it cute? 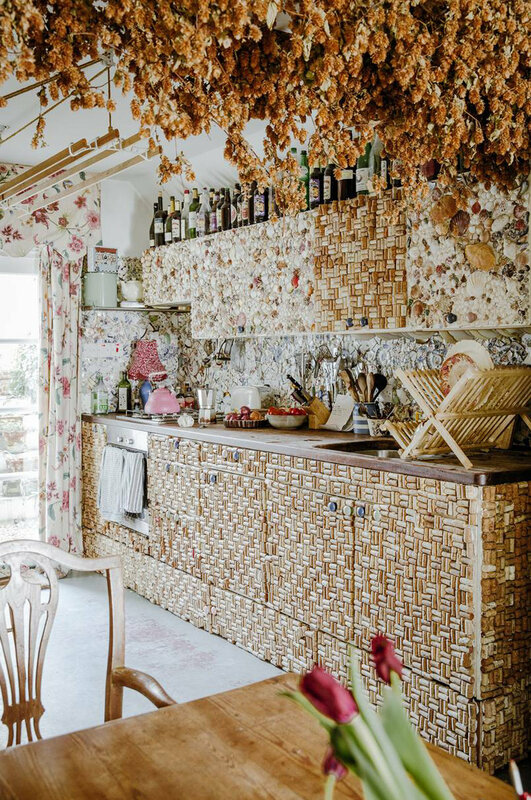 home to Italian artist Joana Santamans, her flat in Barcelona is chock full of character and inspiring details that remind me a bit of the apartments i've lived in. Joana uses large paintings, mid-century furniture, and industrial touches to pull everything together. one of my favorite design elements are the muted Moroccan floor tiles that fill the apartment. it's a major statement, but between the classic pattern and neutral tone, the space feels elegant and fresh. 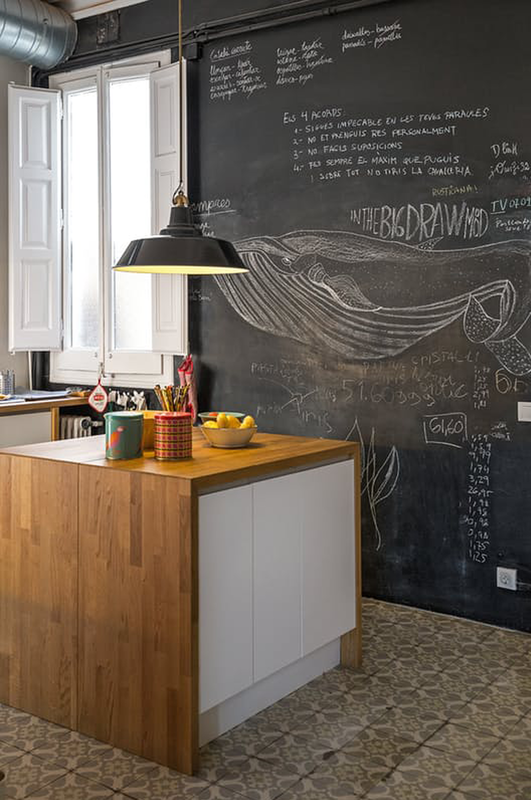 the kitchen sports industrial features, a large chalkboard wall, and ((now trending)) wooden countertops. what makes this apartment particularly special are the little things: carefully found objects, books, and the artist's own work. here, paintings of animals hang around every corner with a dose of whimsy, and splashes of unapologetically bright yellow (my favorite!) accent the floors and crown molding. (i've got a close eye on you, tiles). interior designers always have the best homes. it's cool to see how their design comes alive if they have no rules and no one telling them what to do. 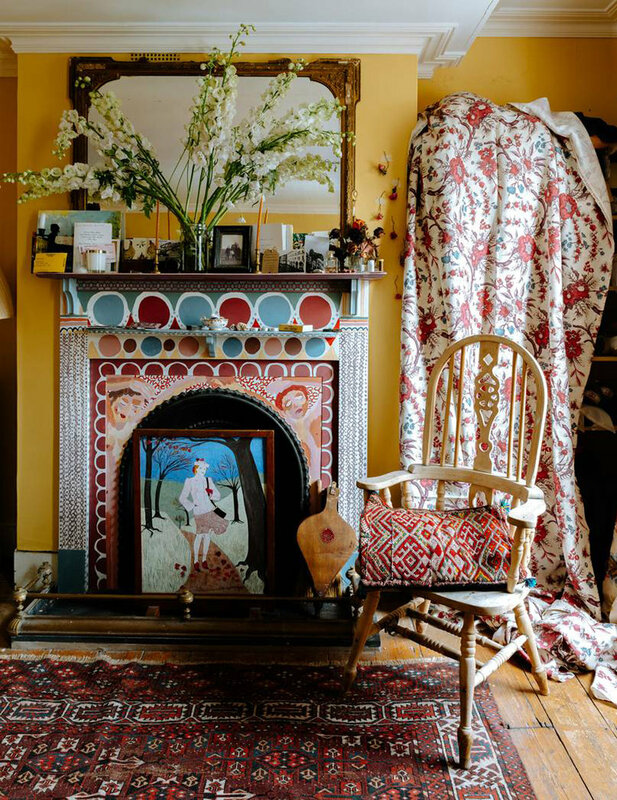 after stumbling upon this interview on Glitter Guide, i fell completely in love with interior stylist, Jennifer Harrison's, bohemian house. founder of Flea Market Fab, Jennifer has an effortless sense, and an enviable collection of Moroccan rugs. every inch of this this colorful, cozy, comfortable bungalow is full of magic -- both outside and in. a wrap around deck has always been a dream of mine. and in my imagination i see something very similar to this one: bright and filled to the brim with plants, found treasures, rugs, and distressed furniture -- including a place to store dinnerware for a spontaneous dinner party. the artist and her cute little pup surrounded by plants -- both real and in wallpaper form. a dramatic geometric runner for a white staircase. it almost looks hand drawn, adding to the rustic, found feeling this home has throughout. an expert thrifter, Jennifer is always hunting for new objects. because of that, she is constantly rearranging her style at home. there is so much going on, but is simultaneously cozy and lived in -- you can tell that each detail was carefully found. poufs are the new chairs. they're especially snazzy in moroccan fabrics. the two contrasting rugs work so well in this bedroom, and the addition of poufs and pillows in similar textures really ties the room together. simple white walls and clean accessories keep the space looking fresh. more rug mixing, and patterned wallpaper. everything just works. if i had to choose, i think this home has left me most inspired to start collecting rugs. not sure if that's a good thing, or a dangerous thing -- sorry in advance bank account -- but the mixture of moroccan colors and prints truly make these spaces homey and unique. i really like those underused spaces in a home. like a hallway. often times i think of a hallway simply as a way to get from one space to another, but these rooms are making me rethink it. 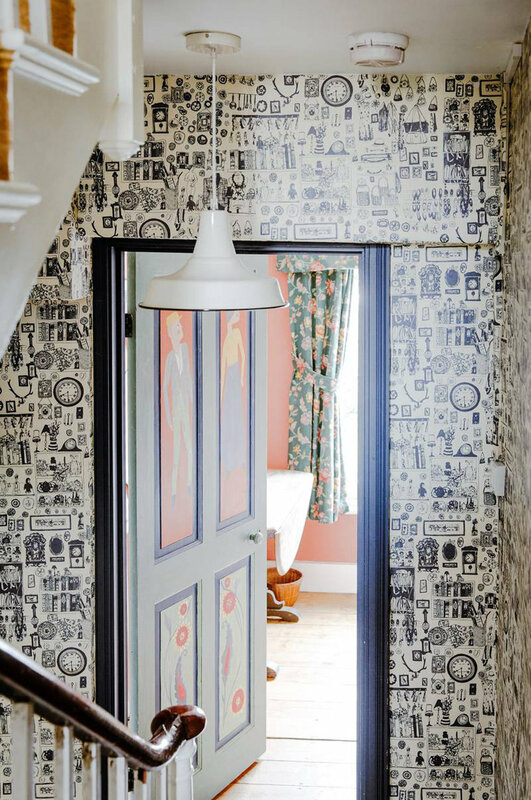 why not add some personality to your walk from the kitchen to the living room? bright tiles, wallpaper, or a colorful rug are all you need. there's no rhyme or reason to the pattern on this wool rug from Beklina, which is why it's so great. another rug from Beklina. i love these colors! this Etsy shop has perfectly styled photos and lovely rugs. i like this one's imperfect wavy lines, and neon pink and purple colors. i'll take the shoes too, please. this rug feels so summery and light. i like the faded blues, and thin embroidery. wouldn't this be great for an indoor patio? i don't have one, but a girl can dream. i wanted to share every single rug from Semikah Textiles, but i made myself pick one. i decided on this fantastic, ombre faded runner -- need it for my hallway! this technically isn't a moroccan rug, BUT the uneven scallops and rainbow hues reminded me of one. the rugs sold at Loom and Field are beeeautiful. Loom and Field is based in France, and they sell vintage moroccan rugs in bright, cheerful colors. this rug's oversized diamond pattern caught my eye. one more pretty rug from Beklina. it breaks my heart that this rug is sold out! the patterns!